The Venona Secrets presents one of the last great, untold stories of World War II and the Cold War. In 1995, secret Soviet cable traffic from the 1940s that the United States intercepted and eventually decrypted finally became available to American historians. Now, after spending more than five years researching all the available evidence, espionage experts Herbert Romerstein and Eric Breindel reveal the full, shocking story of the days when Soviet spies ran their fingers through America's atomic-age secrets. • Information that links Albert Einstein to Soviet intelligence and conclusive evidence showing that J. Robert Oppenheimer gave Moscow our atomic secrets. • How Soviet espionage reached its height when the United States and the Soviet Union were supposedly allies in World War II. • The previously unsuspected vast network of Soviet spies in America. • How the Venona documents confirm the controversial revelations made in the 1940s by former Soviet agents Whittaker Chambers and Elizabeth Bentley. • The role of the American Communist Party in supporting and directing Soviet agents. • How Stalin s paranoia had him target Jews (code-named Rats ) and Trotskyites even after Trotsky’s death. • How the Soviets penetrated America’s own intelligence services. 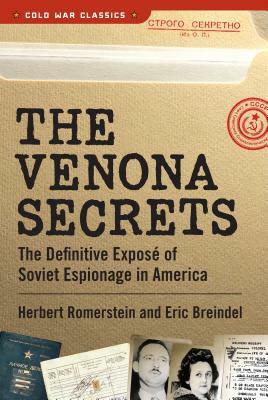 The Venona Secrets is a masterful compendium of spy versus spy that puts the Venona transcripts in context with secret FBI reports, congressional investigations, and documents recently uncovered in the former Soviet archives. Romerstein and Breindel cast a spotlight on one of the most shadowy episodes in recent American history - a past when by our very own government officials, whether wittingly or unwittingly, shielded treason infected Washington and Soviet agents. Herbert Romerstein was head of the Office to Counter Soviet Disinformation at the United States Information Agency from 1983 to 1989. He had previously served as a professional staff member for several congressional committees, including the House Intelligence Committee and the House Committee on Un-American Activities. Now retired, Romerstein continues to write and lecture on the subject of Soviet espionage. Eric Breindel studied at Harvard College, the London School of Economics, and Harvard Law School. Named senior vice president of News Corporation in 1997, he was also a syndicated columnist and the moderator of Fox News Watch, a weekly national public affairs television program. Previously, he had served more than a decade as editorial page editor of the New York Post and worked on the Senate Intelligence Committee. Breindel died in 1998 at the age of forty-two.